Couples who lift together stay together. 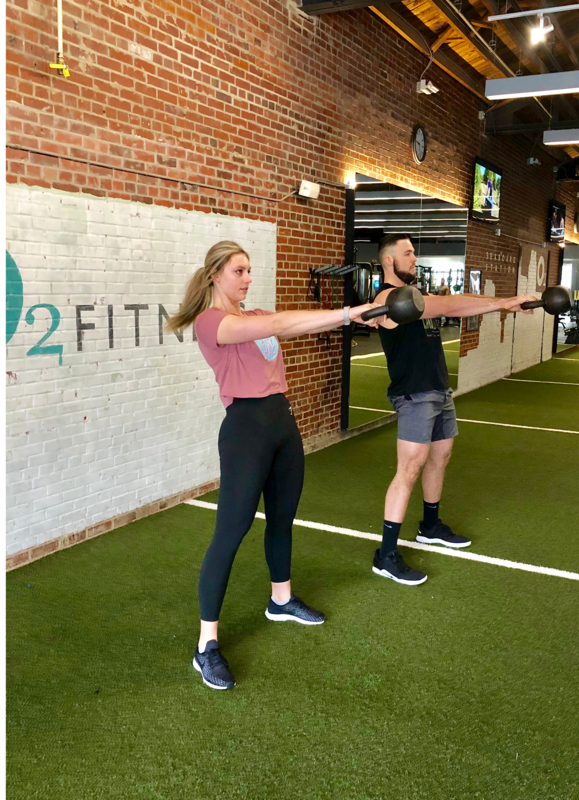 O2 Fitness Seaboard Station Personal Trainer Grant Cain and his fiancé Kristen Harris are two peas in a pod, especially when it comes to their love for heavy lifting. Standing at 6'7'' and 6'1'' tall respectively, Grant caught Kristen's eye during a night on the town when she was wearing heels and noticed he was still taller than her. They met 5 years ago in Chapel Hill, started dating, and will be taking their relationship to new heights by tying the knot this year. The soon-to-be Cains took a break from their wedding prep workout to talk all things fitness with us. How long have you been members of O2 Fitness? Grant: I've been training here for two full years. Kristen: I started working out at O2 three or four months after Grant started here. Seaboard is our main location but we like to try out the other locations when we can. When we were down in Charleston we went to Johnnie Dodds and James Island. We live in Apex so we go to Holly Springs, too. Do you come to the gym together or separately? Why? Grant: We come together on Saturdays. During the week I'm training with clients every day into the evening and Kristen works in RTP so she can't make it all the way here during her lunch. Kristen: Yeah, Saturdays are our day. We both have to work out that day so we do it together because he's training me. When you are at the gym together do you work out together or separately? Kristen: Together. Grant basically tells me what to do. Grant: We do the same machines and alternate. Kristen: We usually do supersets. He'll be on the leg curl and I'll be on the leg extension and then we'll switch. Grant: We literally do the same workout. How are your fitness goals similar? How are they different? Kristen: I guess they're similar because we're both wanting to stay in shape and eat healthy. For me personally, I really like lifting heavy and so does Grant. Grant: On top of that, my biggest goal is to be functional. I've got to be able to stand up and walk around Seaboard all day and train so I need to find good, healthy balances of being strong and being flexible. How does your partner motivate you and keep you accountable to your goals? Kristen: Since he has a training program for me, Grant can see all of my workouts that I log on the app we use. Grant: So know she's doing them. Kristen: And when we work out together he spots me and gives me the confidence to try new things and gives me cues if I'm doing something wrong. The cues are really helpful. What do you do outside of the gym together to stay on top of your fitness goals? Kristen: I do the grocery shopping and the meal prepping. I also cook his dinners at night so he can just come home and eat after a long day. They're usually healthy meals like chicken or rice. Grant: I use MyFitnessPal to track what I eat. Sometimes I'll shoot her a text with my MyFitnessPal macros for the day and if I'm running low on protein or carbs I'll say, "Hey, let's make tonight's dinner fit into this." What are your favorite workouts to do together? Kristen: Definitely leg day. We really push each other. Couples who lift together stay together, right? Grant: A lot of people think you can't work out with your significant other. But if you find a common goal, it's doable. People think training-wise you can't train together but there's a healthy balance. Girls can benefit from lifting and guys can benefit from cardio. Kristen: For us in particular, because we have such weird schedules, being able to work out together is another time we can just hang out with each other. It's like a second date night, just during the day at the gym! What have you learned from each other that you now take into your workouts? Kristen: I was always into heavy lifting just from being a college athlete and being in the gym throughout my life, but it became more of a passion once we started training together. He's taught me that looking fit and lean is not about doing cardio every day. You have to lift weights. When I first got out of college I thought, "Cardio will make me skinny, I'm going to look so good after running these 3 miles." But lifting is what really reduces your body fat and builds muscle. Grant: Kristen introduced me to paying more attention to my diet. As a college athlete I didn't really focus on that. I'd be your typical guy who goes home and just eats whatever is there. Now we're more mindful and Kristen helps to make me more aware of that.